When you hear prospector what do you envision? The old man with the long gray beard, leading his pack mule and collecting rocks and minerals? The wild west and the forty-niners searching for their fortune in gold? The lone man who spent his life searching the hills for hidden treasure is surely a thing of the past. But you might be surprised to hear that prospecting still exist. And new rocks and minerals and hidden treasures are still being found. Yes, loss of public lands, and government regulations make it difficult, but amateur mineral collectors, weekend rockhounders, and even rock and mineral business owners still are digging rocks. Rockhound is the name for people who like to search for rocks as a hobby and rockhounding is what they do. However most mineral deposits are discovered by accident. Of course there are many more modern and sophisticated ways to prospect nowadays. Large corporations employ fancy equipment, geological studies and even airplanes to survey the lands. But this type of prospecting is limited to large deposits and valuable rocks or minerals. Once a promising looking rock or mineral deposit has been found, prospecting becomes mining. Mining is defined as the process of physically removing minerals, rock, or ore from the earth's surface. The deposit is studied carefully to decide if mining the material is even worth it. Many lone miners still dig out rock by hand, using hammer and chisel, and feather and wedges. The larger companies must decide if the deposit is big enough, and rich enough, to justify a large-scale mining operation. Mining is very expensive. Placer mining is the simplest. It is just separating the heavier mineral from sand or gravel. This can be accomplished with various ways from a gold pan to a million dollar dredge. Strip mining is similar, but is done on dry land. Large equipment, such as bulldozers, backhoes and excavators are used to strip the land away and uncover the wanted mineral. Usually the mining is done in large strips. When one strip is done the next is laid down next to it and the first strip is backfilled with the dirt extracted from the new strip. A quarry is a mine where large blocks, usually building material like marble or granite, are removed. Some quarries are shallow, some quite deep. Explosives are used sparingly as they do not want to fracture the rocks. Mines can be surface or "open pit", sub-surface or underground. An open pit mine is usually used for minerals that are close to the surface. Most mines are dug this way. For obvious reasons it is cheaper and safer. However environmentally it is probably the most damaging. Open pit mining means removing everything-trees, rocks, dirt and the mineral. It is usually removed in ever widening steps or benches. Explosives may be used in particularly hard areas. 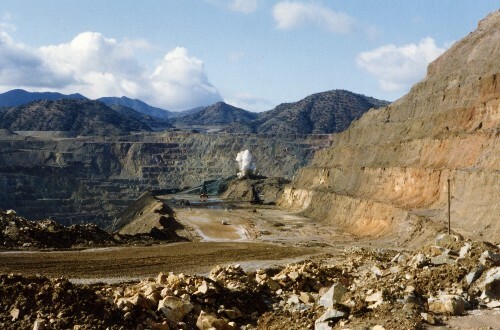 Some of the largest open pit mines are the copper mines right here in Arizona. The material is carried away in huge trucks, to be dumped elsewhere (known as tailings) or to the mill or smelter to be crushed, leached, or processed. Sometimes a huge open pit mine can get too deep or steep to get the ore out. In this case a shaft or hole will be sunk next to it, and the ore will be carried up the hole by cables. This is called a gloryhole. An underground mine is more complicated. Some underground mines are dug with vertical and inclined shafts. The miners may descend on ladders or elevators. The ore is brought out by hand, ore carts, or cables. Other mines are dug horizontally into the side of a mountain. The opening of this type of mine is called an adit. A stope is a room or large opening, sometimes the only place where you can stand upright! Timber is used to shore up the mine. The mineral can run in veins and the mine tunnels will follow that vein. Level or horizontal mine workings are called drifts and crosscuts. At times it is useful to open vertical workings between levels in a mine that is underground; these openings are called winzes or raises. Mines and mining are a controversial subject. Mining does cause damage to the environment. They can be unsightly, destroy the natural habitat, change the way water flows, and clog streams. The large equipment used causes air pollution, the dust fills the air, and chemicals can leak into the ground and the groundwater. Some of the by products released by mining are extremely dangerous. And there are an estimated 500,000 abandoned and dangerous mine sites in the United States alone. So why do we mine? Because mines give us the raw materials needed for the construction, manufacturing, and energy upon which our everyday life is so dependent on. From the approximately seven thousand mines operating today, we get all the materials needed in the production of household products, airplanes, buildings and cars. Mining is the source of mineral commodities that all countries find essential for maintaining and improving their standards of living. Mined materials are needed to construct roads and hospitals, to build automobiles and houses, to make computers and satellites, to generate electricity and provide heat, and to provide the many other goods and services that are essential to our way of life. In addition, mining is economically important. It provides employment, and taxes that pay for hospitals, schools, and public facilities. Mining accounts for a significant portion of gross domestic product for many countries. Mining also supports associated activities, such as manufacturing of mining equipment, engineering and environmental services, and the development of world-class universities in the fields of geology, mining engineering, and metallurgy. The economic opportunities and wealth generated by mining for many countries are substantial. Here at OakRocks we know that without mining we wouldn't be able to bring to the public the variety of rich and beautiful stone products the earth has to offer. However we know it is important to practice responsible mining and to protect the environment as much as possible.